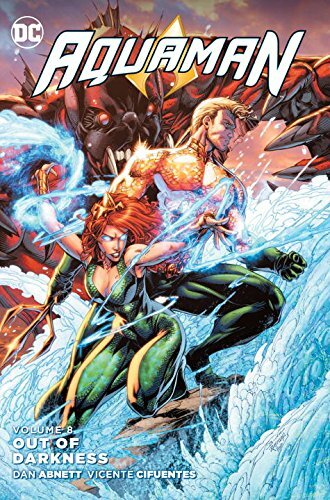 When it became apparent that Dan Abnett was following through on plots introduced in the finale of Aquaman’s ‘New 52’ iteration in the ‘Rebirth’ version, DC belatedly released a collection of that earlier material several months after subsequent stories in The Drowning. 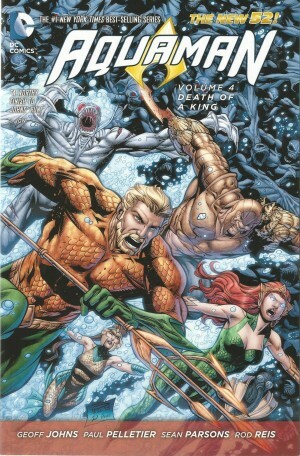 As well as being a slim graphic novel, the content is slight. 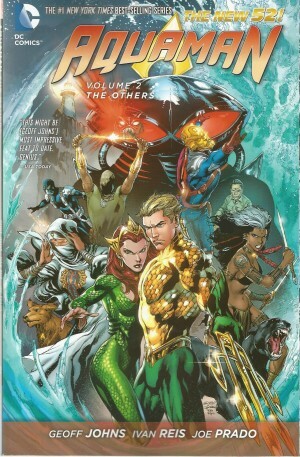 Abnett is feeling his way into the character, and the big idea he introduces is Aquaman convincing himself of a mission to negotiate some form of détente between Atlantis and the surface world. This is after all that’s happened in the previous graphic novels going all the way back to Geoff Johns’ re-boot in The Trench. 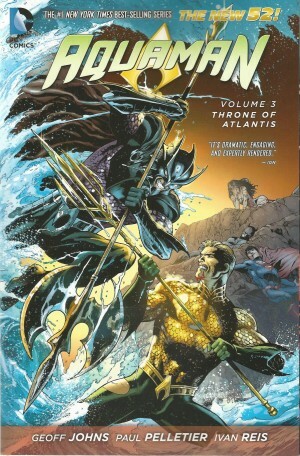 It’s an idea that comes to fruition later, however, as Aquaman occupies himself with an old foe and new one. The good ideas aren’t always apparent. 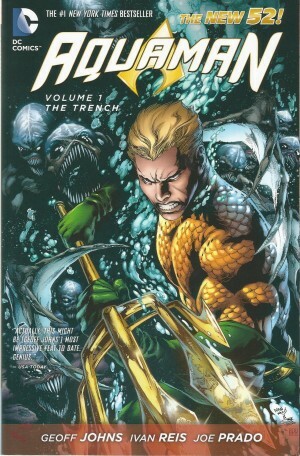 It’s only Abnett’s subsequent material that enables astute readers to piece together what the Scavenger was doing scouring the oceans, and the inclusions such as comedy FBI agents as a feeble Greek chorus irritate instead of transmitting as cute. Vicente Cifuentes illustrates most of the book, and the wonder is in his page layouts rather than his sometimes suspect figurework. 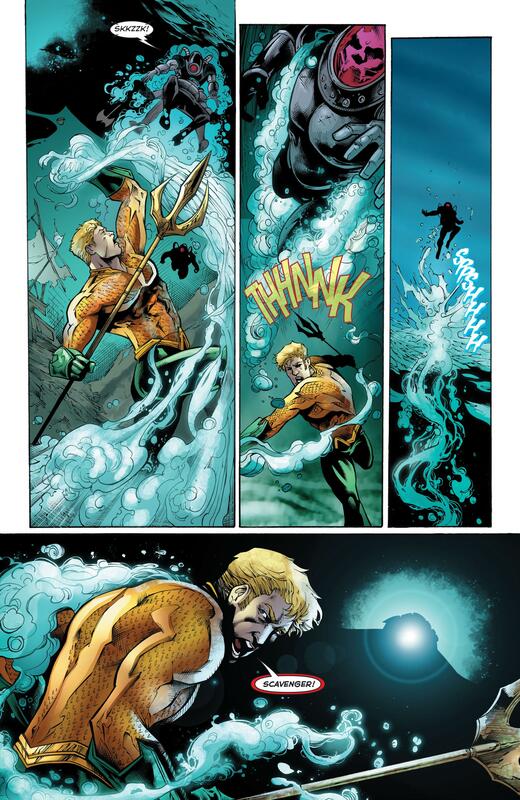 Both he and Brett Booth, who pencils the long battle with Dead Water, tend to objectify women in the superhero tradition, but give Cifuentes an undersea battle to draw and he’s terrific. On the basis of Out of Darkness the conclusion would be that Abnett’s only capable of producing distinctly average superhero material, with little complexity about it. That would be wrong, because given the chance to determine his own agenda fully in the ‘Rebirth’ graphic novels Abnett is very good indeed.